Looking for a chocolate dessert? 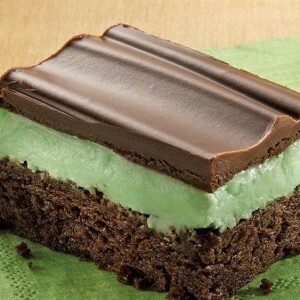 Then check out this mouthwatering mint brownie recipe. Heat oven to 350°F. Grease bottom only of 13x9-inch pan with shortening or cooking spray. Make and bake brownie mix as directed on box for 13x9-inch pan using water, oil and eggs. Cool completely, about 1 hour. In large bowl, beat all filling ingredients on medium speed until smooth. Spread over cooled brownies. Refrigerate about 1 hour before frosting. In small saucepan, melt chocolate chips, 1/4 cup butter and the cream over low heat, stirring constantly. Remove from heat; cool 10 minutes. Pour over filling. Refrigerate about 1 hour or until chocolate is set. Cut into bars. Store in refrigerator. We’re Making Brownie Bowl Sundaes // DOES THIS RECIPE WORK?